Sure, you can do all the footwork by going to the LinkedIn home page and looking around to see what messages or changes have occurred. The true power of staying connected, however, is having LinkedIn automatically contact you with the information you need to stay informed. Clicking the Manage link next to Privacy & Settings (after hovering your mouse over your profile icon from the home page) takes you to the settings page, which contains information about your account and your LinkedIn settings. Click the Communications header on the left side of the screen to bring up the Communications settings. This is your hub for controlling how you interact with LinkedIn and how the site communicates with you. 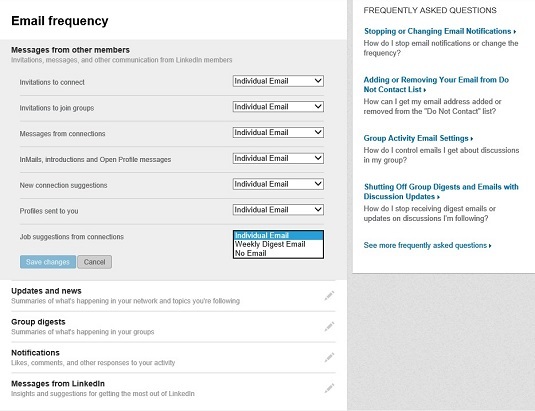 Control your LinkedIn settings from the Account & Settings page. On the Account & Settings page, click the Set the Frequency of Emails link in the Emails and Notifications section. You’re taken to the Email Frequency page. For each section, like Messages from Other Members, click the pencil icon on the right side to expand the list of options. Decide what emails you want to get from LinkedIn and how often. Individual Email: As soon as something occurs in a given category, like introductions, invitations, or job notifications, LinkedIn sends you an e-mail with that one item in the email. Weekly Digest Email or Daily Digest Email: Instead of individual emails, LinkedIn groups activities in a given category and sends you one email in a digest format, with a summary at the top of the email and the detailed activities below the summary. Note that Daily Digests are for Group updates, while Weekly Digests are available for General and Group updates. No Email: Turn off email notification. You can read the message, though, when logged in to the LinkedIn site. (Optional) Click the pencil icon next to the Messages from LinkedIn header and select the Individual Email for the Details on New Products, Tips, and Special Offers option to receive information from LinkedIn. Scroll down to the bottom of the page and click the Save Changes button. You return to the Account & Settings page. Click the Set Push Notifications link in the Emails and Notifications section. You’re taken to the Push Notification Settings page. For each of the two sections, Messages from other members, or Notifications, click the pencil icon on the right side to expand the list of options. Decide when you want LinkedIn to notify you when events occur. Review the list of options and decide when you want LinkedIn to “push a notification” or e-mail you when something that involves you occurs on the website. If you want LinkedIn to notify you when something occurs — when someone shares your update, for example — you would select the check box next to that option. If you don’t want to receive the notification, deselect that check box. After you’ve made all your selections, click the Save Changes button. You are returned to the Account & Settings page. Click the Select the Types of Messages You’d Prefer to Receive link from the Settings page. A box pops up offering you several options regarding the types of messages you are willing to receive from LinkedIn members. Decide what messages you want to receive from LinkedIn members. 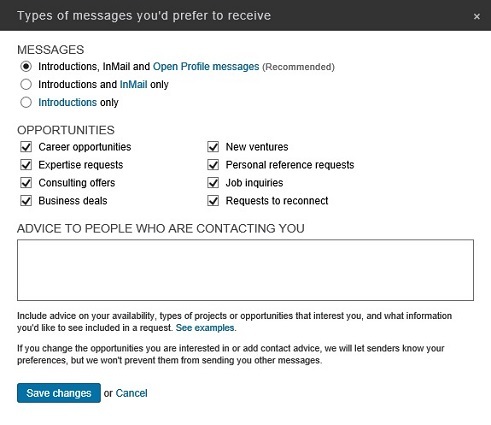 (Optional) You can select the check boxes indicating which opportunities you are interested in hearing about through LinkedIn, and you can advise people on how you want them to contact you.LinkedIn provides eight options, such as Career Opportunities and Business Deals, that you can select, but the advertising of these opportunities has been limited by LinkedIn. Type any instructions in the Advice to People Who Are Contacting You text box to let people know how to best contact you. Any information you put in the Advice to People Who Are Contacting You text box will be advertised on your profile for your network to see, so don’t include sensitive or private information in this box. Anyone on LinkedIn: This is LinkedIn’s recommended setting. After all, you still have to approve the invitation to connect. Only people who know your email address or appear in your “Imported Contacts” list: If you choose this option, LinkedIn will either prompt the person sending the invite to type in your e-mail address, or it will check that person’s e-mail address against the list of contacts you imported to LinkedIn. This will occur before LinkedIn sends you the invitation. Only people who appear in your “Imported Contacts” list: Choose this option if you only want to receive invitations from people you imported from your e-mail or address book into LinkedIn. This way, even if someone knew your e-mail address, he couldn’t send you a LinkedIn invitation. Click the radio button next to the option you prefer and then click Save Changes. The pop-up box disappears, and you are back on the Account & Settings page. (Optional) If you want to receive invitations to participate in LinkedIn’s research efforts, click the Turn On/Off Invitations to Participate in Research link. You can also click the Turn On/Off Partner InMail link if you want to opt in to offers from third-party companies that partner with LinkedIn. This completes your options when it comes to Communications. 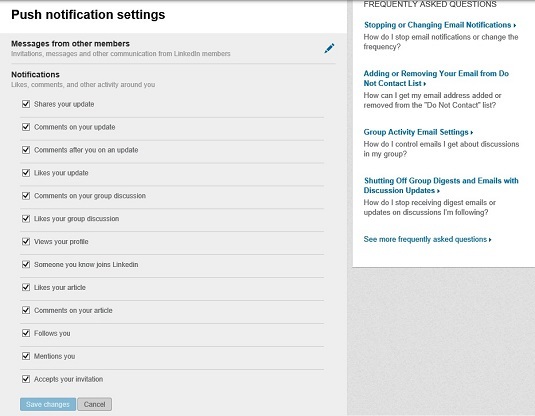 You can always click Profile, Account, or Groups, Companies & Applications to control more of your LinkedIn experience.